Hi and welcome to day 10 of the Whole Lotta Bag Along. We’re down to the final finishing touches before we put the outer and the lining together, that is adding the adjustable strap and putting in the grid bag bottom. When you’re threading the strap through the first ring on the side of the bag, try and make sure the short stitched end is right side up, and thread through from the side outwards. This will mean that when you thread it through the slide, you will hide the short end between the two layers, and it won’t dig into your shoulder. Make sure you don’t twist the strap at any point along the way. Double check before you stitch the end in place! If your grid bag bottom has been stored rolled up, unroll is and flatten it under something heavy for a couple of days. 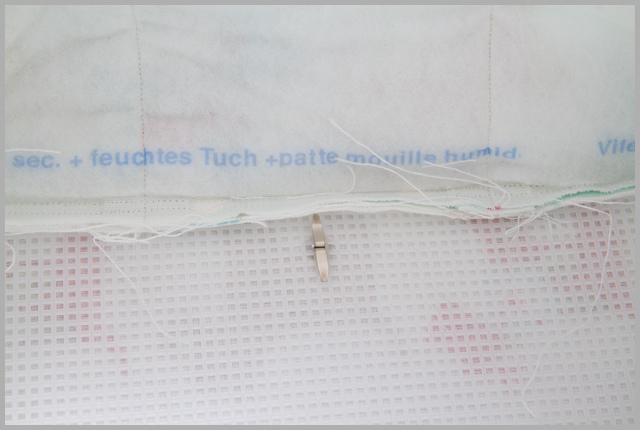 Measuring for the feet – the reason this is done at this stage rather than before sewing the bag together, is that we just don’t always sew perfectly straight, so by the time you get the whole thing together, you might find one corner mark noticeably out of line with the others. Trust me on this! 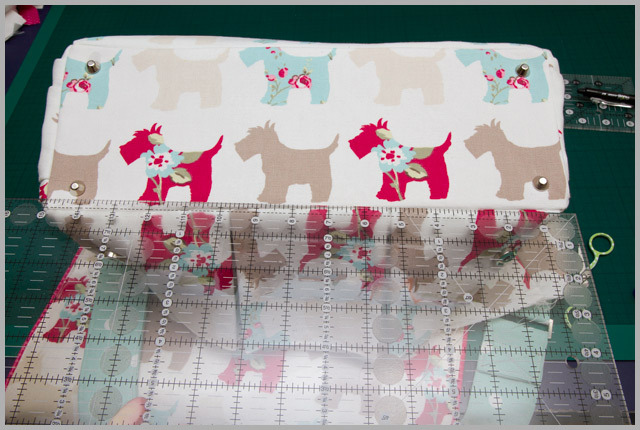 When measuring for the feet, I usually use a little 3 1/2″ square quilting ruler, and match up the 3/4″ mark with the corner, then make a dot at the corner of the ruler. You might find a mark doesn’t completely match up with a hole in the grid – a teeny bit of wiggle room is allowable, but try and be consistent about how you do this or all your feet might be slightly out of line with each other! When you’re fitting the grid bag bottom in, make sure it goes tucked under the seam allowance to keep things neat and flat. I sometimes use magic tape to hold it that way while I’m inserting the feet if it’s trying to pop out. The Fray Check is not 100% vital, but it will stop you ending up with an ever expanding hole. Uhu glue diluted with a bit of water will also work. Just one more step to go now, as ever, if you have any questions or problems, please let me know! Great tip about the uhu glue!! Uhu glue instead of fray stop – genius! All your tips are good. The bag is getting near finished by the look of it. It's a great set of instructions!